This bottle was bought in Napa and saved as a celebratory wine for Teri completing her Master’s degree! Price…well…too much to mention. Artesa is known for their award winning Pinots and this bottle (limited production, only 250 cases) has taken double gold at international fine wine competitions. 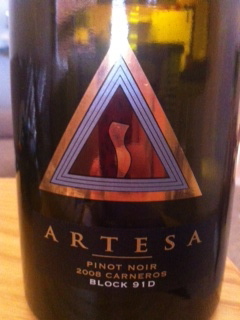 This entry was posted in 90+ points, Impress a Snob and tagged 2008, California, Carneros, Napa Valley, Pinot Noir, Red by aaronandteri. Bookmark the permalink. | The Vino Duo <Loved it!